From Streetfire.net. 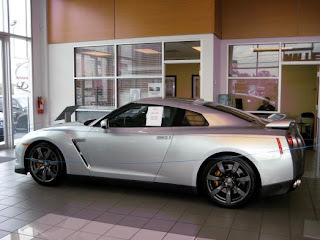 Part one of a series of information from Streetfire on their Nissan GT-R. Big ups for the mention of this blog. I'll get it back up to date, and on top of things the next week. 15 years. That’s how long I’ve waited to own Godzilla, and here I find myself on a plane flying into tropical storm Fay pounding Atlanta the day I take delivery. Even though my wife and I had recently moved with StreetFire from Atlanta to Los Angeles, we chose Nalley Nissan in Atlanta, Georgia to order our car back in February. I had been smitten with romantic images of taking our new arrival around Road Atlanta shortly after delivery, perhaps even a visit to the Tail of the Dragon. Now I realize we are going to have to arrange transport back West as I don’t want to break the car in on the never ending monotony that is I40. Despite missing a proper Road Atlanta track day, I’m happy Fay gave me a little wet weather exposure. The GT-R is Los Angeles bound, and doomed to a future of dry desert mountains and eternal sunshine. Coming soon, Part 2: How to transport a car cross country.